My 4-year-old son is the oldest of my four kids. With the other three children clustered together in age (only six months apart in total), sometimes he seems much older than the rest — even though it's just a year. And though, he's very much the big brother, he's still a little boy and not without fears. One of the biggest is a fear of mascots. That's right — mascots. My always-brave son would become frozen in fear at the sight of a mascot, even if it was completely across a stadium. The mascot fear carried over into other things too, such as giant balloons (think Thanksgiving Day parade) and even oversized piñatas. 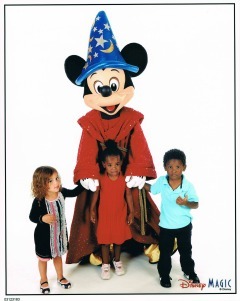 When we were invited on a Disney Magic cruise to the Caribbean recently, the whole family was overjoyed with my 4-year-old leading the way. And then, I thought of one thing — what about the characters! The Disney characters are not unlike mascots and I just knew this would spell big trouble. And the first night of the cruise, my suspicions proved correct. My son was playing in the arcade on the ship when Donald Duck came strolling in. My little boy ran and jumped in his daddy's arms, shrieking and shaking. Not until the duck was completely out of sight could he return to normalcy. Our cruise departed out of Galveston — a new starting point for Disney Cruise Line — with stops in Grand Cayman, Costa Maya and Cozumel. Every single thing about the cruise was amazing (more about that in upcoming articles), but the favorite thing for my 4-year-old son was The Club. 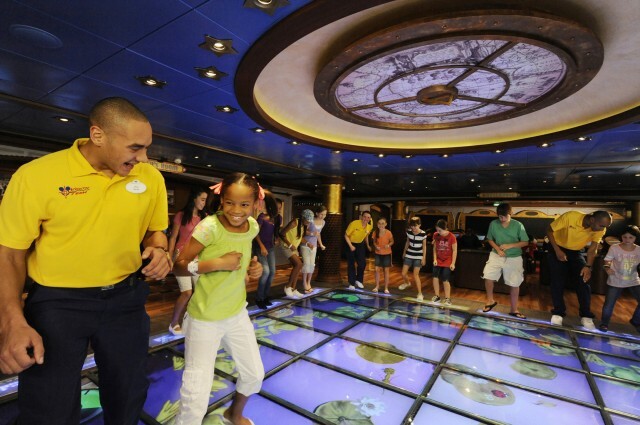 Aboard the Disney Magic, you'll find numerous Youth Clubs. Whether you have preschoolers or teens, there's plenty to see and do. For my son, it was the Oceaneer Club and the Oceaneer Lab that took over his days (and some evenings) at sea. Every morning as soon as his eyes opened, the first words out of his mouth were: "Can I go to the club?" He would be the first to arrive, and all day long he'd enjoy fun-filled activities without a care in the world for his parents or the rest of his siblings. I don't know every detail about all the magic that went on inside the Oceaneer Club and Oceaneer Lab — but every day my son would return as happy as I've ever seen him. And he'd be tired — oh so tired. Twice he even fell asleep at dinner. While my son was off at the Youth Clubs enjoying himself, the rest of the family would take part in other activities on the ship. The access to the characters and princesses was unbelievable — from scheduled photo opportunities to character dance parties to impromptu meetings. My younger son and my two daughters were so excited about all the time they got to spend interacting with their favorites (as evidenced by the photo to the right). Helping your children deal with their fears is always difficult for parents. You want to protect and shield them from all the things that scare them — but you also want them to face their fears, to overcome them and to grow. So on the morning of the "character breakfast," I knew my son would have no choice but to deal with his mascot fear (well, I guess he could have gone running from the dining room). We were thrilled to find out that each character would be coming to every table in the dining room for a couple photos with each family. With a fabulous table located near the entrance, we were the first family to be faced with Mickey! And as I reassured my son verbally over and over as Mickey approached, then it happened — the turning point. 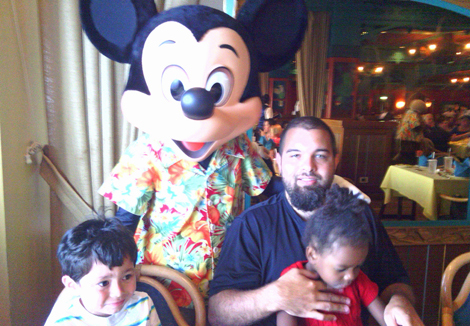 During the slightly-blurry photo above, Mickey Mouse tapped my son on the back — and that's all it took. A simple gesture, but it made the world of difference. His face, which had been paralyzed in fear, quickly turned to a smile. "Mama, I'm not scared of Mickey. He's nice. He tapped my back." And that was it. It was over. On the final night of the cruise all the kids from the Oceaneer Club put on a performance at the Walt Disney Theatre on the big stage in front of all the parents to see. And as my son danced and sang about friendship among all the dozens of other kids, one thing caught my eye — my son went out of his way to go over to Mickey (who was leading the group) and give him a high five. And it was then, right then, that this mama cried. Disney Cruise Line — now leaving from Galveston — offers fun itineraries to Port Canaveral in 2013 with a day at Castaway Key and a day to see Walt Disney World! Also, kids sail free from Galveston — for a limited time in 2013. Check out all the details at disneycruise.com.